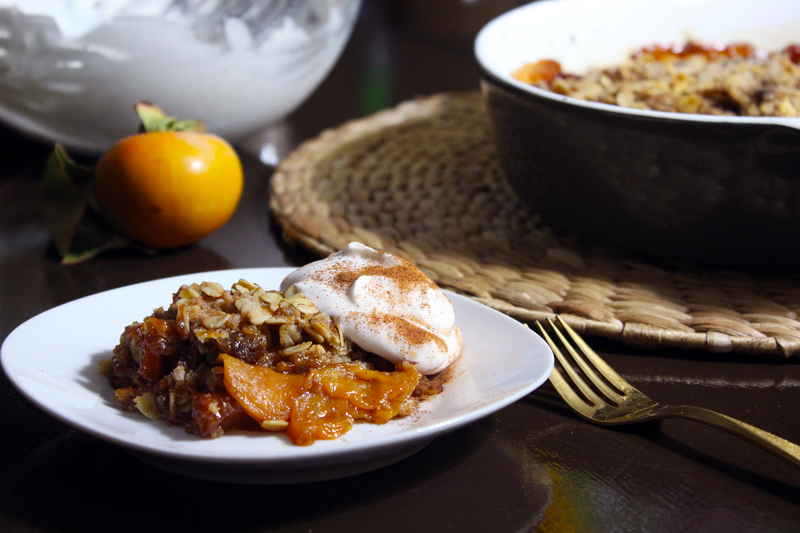 Persimmon isn’t the most common fruit, so I had to improvise with this recipe. I’m pretty happy with how it turned out! 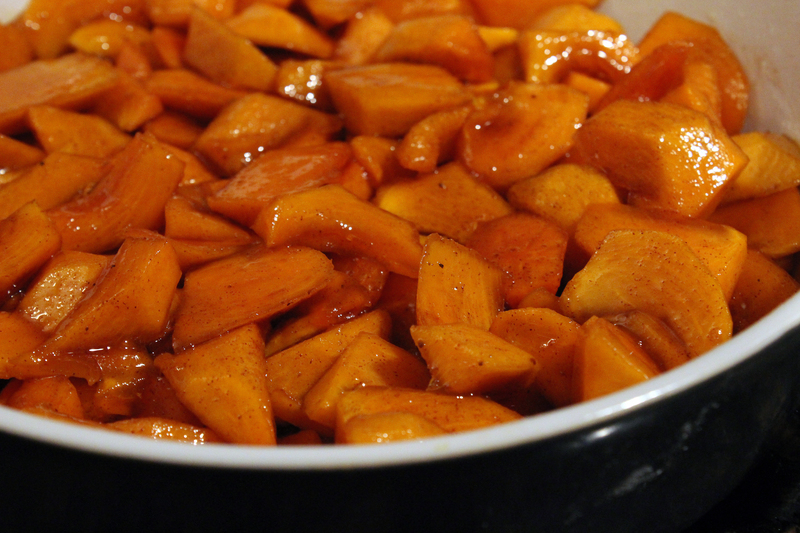 If I ever find myself with a ton of ripe fruit wondering how to use them before they go bad, baking is a great go-to. 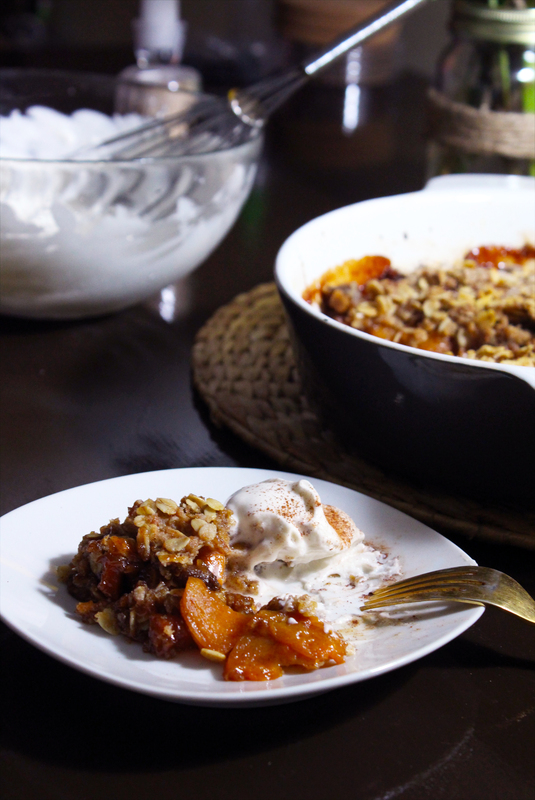 One easy way to use up all your extra fall fruits is to bake them into a crumble! It’s like all the goodness of pie- the soft warm fruit, the crumbly topping, and the smell of cinnamon wafting from the kitchen; but it is less stressful because there’s no crust to fret over! We recently had a family get-together for my grandma’s 89th birthday, and in true Filipino fashion, everyone was sent home with boxes of food. One of my aunts has persimmon trees, and there was a huge box of persimmons that I helped myself to. I got excited and picked a few too many. I eventually realized there’s no way I could finish an entire bag by myself, so I decided to make a crisp with them! I also made a bourbon maple whipped cream to go with it. 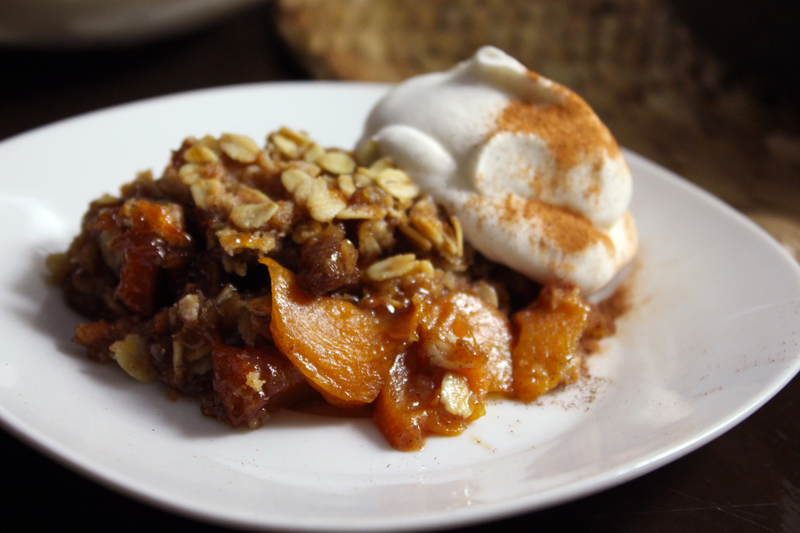 It’s more savory than sweet and has a little kick to it- a good balance for the sweet filling and crunchy topping on the crumble. I topped mine with a light dusting of cinnamon. 2. 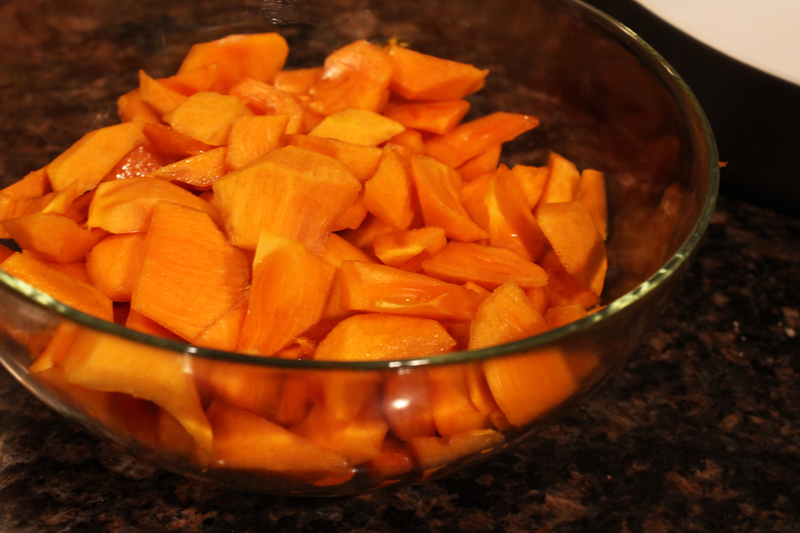 In a medium sized bowl, toss the sliced persimmons with the other ingredients so all the pieces are fully coated. 3. Prepare your bakeware by coating the inside with some butter, and a dusting of all purpose flour. 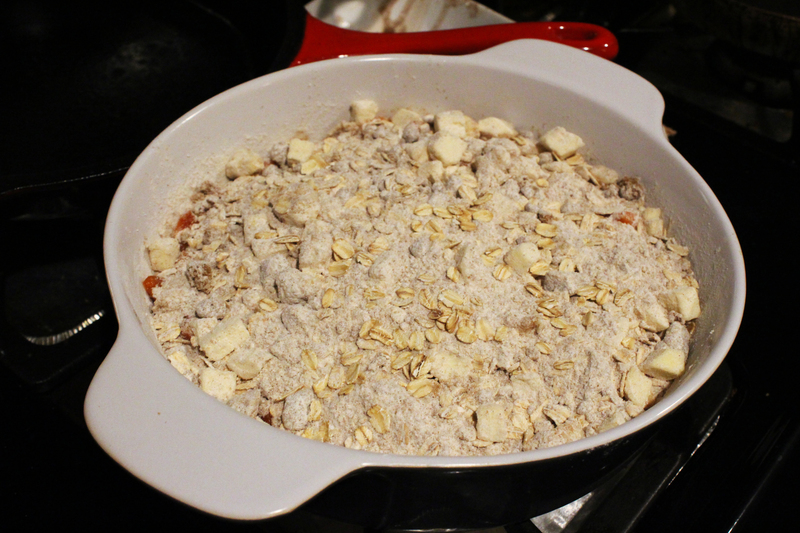 I then let the mixture sit in the dish for about 10 minutes. Yes, the butter must be frozen or else the topping just won’t be crispy! Trust me. 1. Mix the dry ingredients, leaving just the butter out. Once the butter is cut up into tiny pieces, add the the dry topping ingredients. If you have a food processor you can just cut the butter into small pieces and pulse in with the other ingredients (but add the oats later) till it looks like the mixture below. Evenly cover the persimmon filling with the topping. 2. Bake for about 45 minutes or until the topping is golden brown and the edges are nice and bubbly. Chilling a medium sized bowl and whisk beforehand keeps the whipped cream nice and cold. I also noticed it doesn’t look as pretty the next day, so make this right before serving! 1. Mix together the bourbon, maple syrup (if you choose), and vanilla extract in the medium sized bowl until it reaches an even consistency. 2. Add the heavy cream and quickly whip the mixture until it’s just firm enough to lift from the sides of the bowl as mix with your whisk. If you overdo it, it will get too thick and look strange! 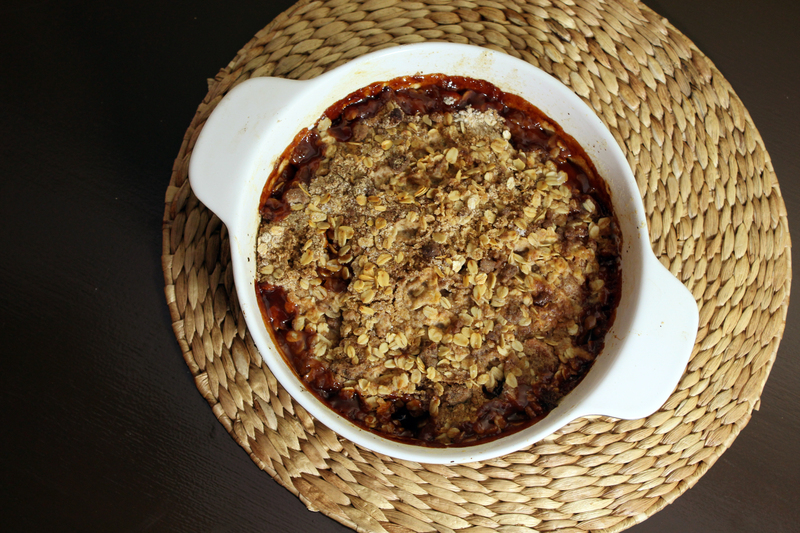 Serve alongside your warm crumble with a dusting of cinnamon and enjoy! So glad you stopped by! I have all these fuyu persimmons & had no idea what to do with the bounty. I’m going to give this recipe a try. Thanks! Looks delicious! I love persimmons. When living in California we actually got an overload in a CSA box and I was dreaming up ways to use them for weeks. Wish I had this recipe then.